ArDh - A Hindi Rock Band by (Ar)indam &(Dh)ruv. Following our passion to rediscover the better 1/2 of our lives within the infinite realm of music!! 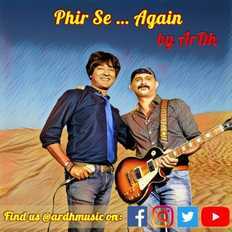 Music is what brought us back together to launch our band’s (ArDh) first album ‘Phir Se…. Again’. It has been 20 years since we played together as a band and we want you all to be the pioneering voyagers of our inaugural flight into launching our first album. The lyrics speak of our individual journeys through life as a pilot and a banker. Dhruv is the guitarist and songwriter as well as a Flight Commander in his day job. His love for flying translated to endless miles of infinite skies and strengthened his resolve for getting back into music and piloting his own band while bringing the thrill of rock music to you all. Arindam (Ari) is the vocalist and songwriter as well as an Entrepreneur based in Singapore. With an MBA from INSEAD, his unending curiosity to know how things work in business, as a technologist, to striking a balance in his own FinTech venture has rekindled his passion for this musical adventure.